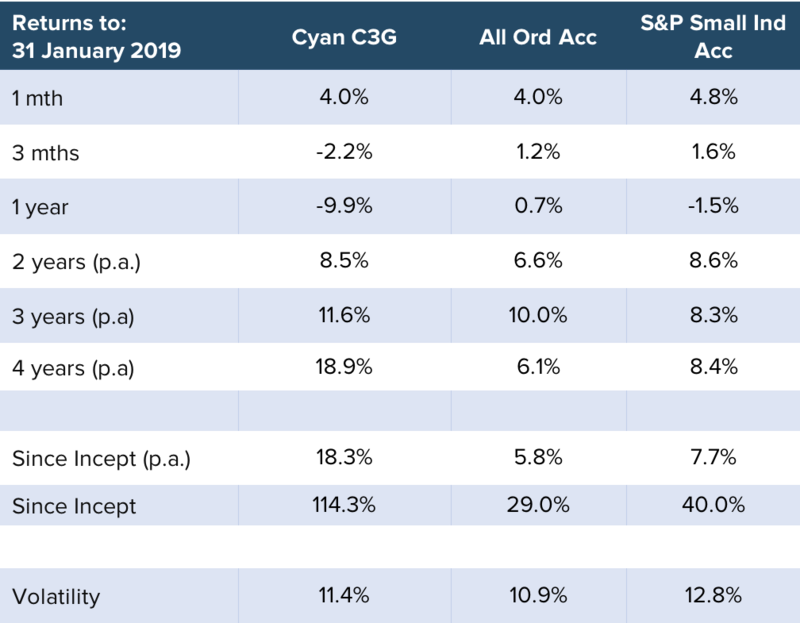 The C3G Fund enjoyed a positive start to 2019 delivering a return of +4.0%. 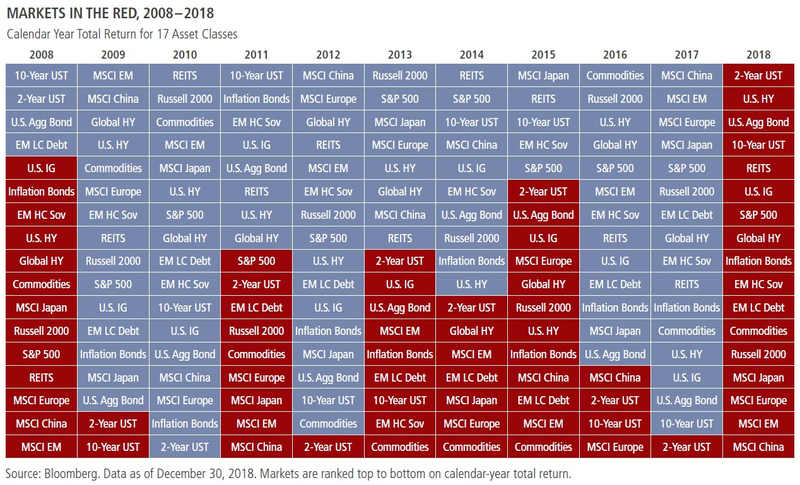 To put last year’s poor performance of Australian equities in some sort of context, the table below shows that for the first time in recent memory, all asset classes (other than cash of course) retraced in value over the 2018 year. As we stated in our December Monthly Update: “Markets are driven by sentiment in the short term and value creation and realisation over the medium and long term – but never in a straight line”. After such a negative year, we feel that markets are more conducive to rewarding measured investment philosophies and we are optimistic that the underlying fundamentals of companies are being considered in a more pragmatic light. The C3G Fund currently comprises 24 companies, with no individual position representing more than 6% of the total portfolio. We have also made the decision to keep approximately 40% invested in cash. That said, as stock prices fell throughout previous quarter we did deploy additional capital. Murray River Group (MRG +58%): The Fund invested in this producer, packager and seller of organic fruits through a balance sheet recapitalisation in late 2018 at a significant discount to the prevailing NTA of the company (10c vs 16c). Whilst the operational turnaround in the business appears to be on track, the shares have experienced a volatile ride post the recap, having initially fallen 25% (to 7.5c) before this month’s rebound (to 12.5c). This clearly highlights the fickle nature of smaller companies and the importance of having a deep understanding of the underlying fundamentals of a business but also of portfolio diversification (not having all our eggs in one basket). Afterpay Touch (APT +28%): A long-held position in the Fund, Afterpay has faced extreme share price volatility, but recent price weakness rapidly reversed when the company released its quarterly update illustrating the strength in the Australian business and impressive traction in the US. 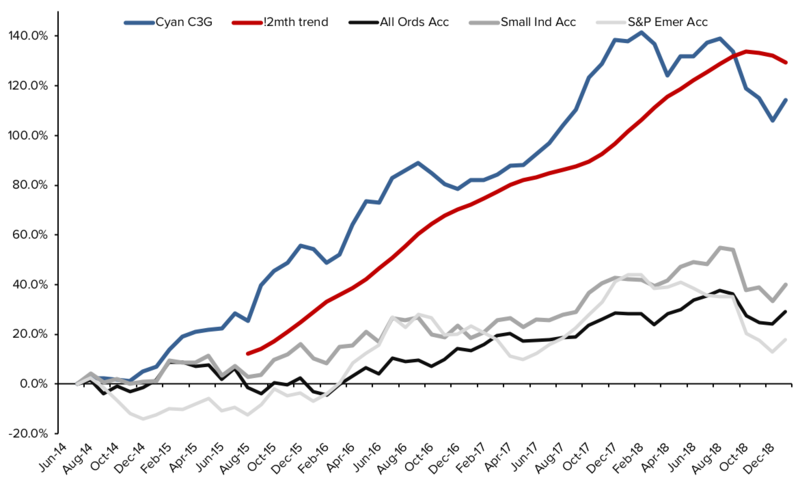 Additionally, after Afterpay’s appearance at the Senate enquiry into credit and financial services, the risk that the sector will be required to adopt bank-like credit checks appears to have softened. It appears we weren’t the only ones attracted to the assets and favourable balance sheet with Spicers receiving a takeover offer in January at a price 45% above our entry price. Splitit (SPT +175%): Often described as “an Afterpay look-alike”, Splitit offers a tech-based payments platform. It has similar drivers to Afterpay but is much earlier in its lifecycle phase and has a slightly different target market and markedly different business model. We invested a relatively small amount in the IPO of the company, which was embraced strongly by the market in its first few days of listing. Dean wrote about new IPO Splitit for Livewire: Is Splitit the next Afterpay? As always, a handful of companies didn’t perform positively in the month including Freelancer (FLN -18%), EVZ (EVZ -12%) and Acrow (ACF – 7%). In each case there was no negative company specific news flow and we remain invested and look forward to meeting with the management of each in the coming weeks. “Of course investing in bear markets is not easy, nor fun, nor profitable. But we know that these are the times we have the ability to set the Fund up to benefit fully from any upturn. Just as bull markets do not last forever, neither do bear markets, and often the best time to invest, is when nobody is considering doing that”. Indeed over that past 6 weeks the broader markets have pared back all the losses pre-xmas and the market tone appears significantly improved. At Cyan, we firmly believe that sticking to the basics, searching for and investing in high quality companies with a management team that focuses on returns through intelligent capital allocation in the growth phase of their business lifecycle. We do not pretend to know the short-term direction of the market, but obviously when it pulls back it presents cheaper entry points into the companies we are researching. February reporting season is upon us and we are confident that our investee companies will deliver a solid set of numbers and outlook statements, providing positive share-price catalysts. It also presents a good opportunity to meet with the respective management teams and gauge the underlying performance of the business and both the challenges and opportunities that lie ahead. As always we are contactable in person and encourage you to do so if you have any questions for us.